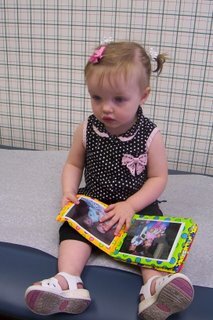 MM had her 18 month check up. I always take a picture of her in the doctor's office. Sorry dear, we have to go to the clinic for shots later. I promised her french fries on our way home. What a sweet photo! My son has that little photo album too. He loves it.